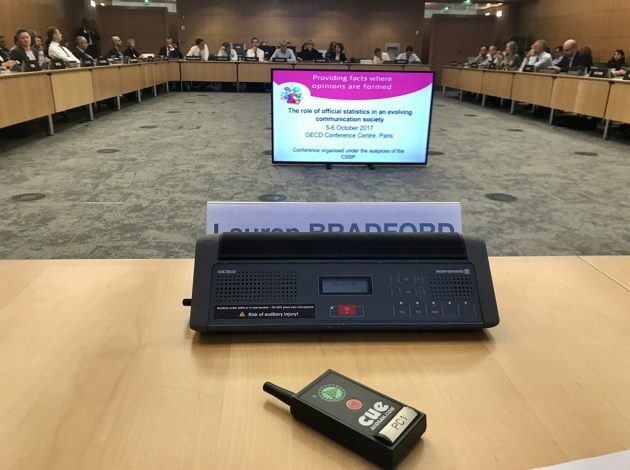 Last week I was lucky enough to represent the ONS social media team in Paris as a speaker and panel member at the Organisation for Economic Co-operation and Development (OECD) conference ‘Providing facts where opinions are formed’. Statistical institutes from all over the world participated – including our very own National Statistician John Pullinger and ONS’s Head of Communication Rob Bumpstead – in what was an extremely interesting and positive event. There was a real passion for understanding social media users, and how to reach people through official statistics in an evolving communication society. This formed the basis of the day with experts from a range of areas, and external speakers advising Director Generals and Heads of Communications across the global statistical community. It was an honour to be asked to lead a talk on social media best practice for the session ‘Humanising data to tell stories that speak to social media users’. My panel was a mixture of communication professionals, a data visualisation journalist and a language expert to make for a fascinating and enriching discussion from a range of experiences and sectors. As a Social Media Manager I was introduced as “the scariest person in your organisation”, which I’m not quite sure how to take! I talked people through my experience managing ONS’s social media content over the last four years and some of the practices we’ve put in place to ensure quality, optimised content that adds value. I made sure to include clear takeaways delegates could immediately share with their organisations, with plenty of case studies, while remaining high level enough to show strategic value and impact. My examples showed how we experiment, expand, learn and adapt, and I stressed the importance of going where the people are…not expecting them to come to you. Looking through existing networks and institutions to engage with, being a voice in their forum, and going to them were principles echoed throughout the day. I shared examples of where we engage in current debate through existing conversations, and partnering up with others to amplify our messages and reach new audiences. I also wanted to specifically mention our social media style guide and our tweeting statisticians network, which are both used as a benchmark for best practice across government and other statistical agencies. My session was the final one in a stimulating day of presentations and debates, so it was great to be able to first hear from others and reassuring that a lot of the same principles and values were being shared by other experts in the field. ONS examples were regularly referenced as strong examples throughout the day and we received a lot of praise for our good work, as well as ideas for further opportunities that I brought back and shared with the team. Communications Strategist and Digital Anthropologist Rahaf Harfoush led an insightful session on how technology and culture affect each other, and how technology is weaving itself into the social fabric of our lives, acting as a hidden force influencing us. As we enter an era of unprecedented technological intimacy, when discussing social media our focus needs to shift from platform and tool focused to human oriented. We discussed who our audiences are, how they’re currently getting their facts, and how we might reach them. Social media is the main source of news for the 18- to 24-year-old age group, so the advice was go big on this platform when you want to reach them. Social media usage varies significantly internationally, so it’s important to get to know yours. People tend to disproportionately trust brands they’re aware of, so we need to work on raising brand awareness. There were interesting discussions around thinking long term – engaging with schools and universities, where opinions are formed and shaped. A university student led us through a day in the life of a student and entry opportunities for our statistics. One of the main factors when deciding to read a piece is whether it’s mobile friendly. It was interesting to hear that articles were not shared publicly but forwarded to friends via Whatsapp; something for us to consider for the share buttons on our digital products. Audiences forget facts very quickly and social media has become a key source of news for all demographics, so a common social approach shared was to re-cut, republish, reach out and promote content. Through the examples in my presentation I showed that often we’ll receive higher engagement when we repromote statistics when they’re topical and relevant, rather than at the time of release. OECD’s Director of Public Affairs and Communications introduced me to the term “jargon monoxide” and explained that there’s a balance between rigour and simplicity to be struck – but as communicators we tend to stay closer to the rigour side. More people are sharing misinformation on Facebook than correct information and we need to acknowledge that our statistics often don’t conform to what people believe about the world, and find a way to tap into that and change the narrative. Dulce Ramos at the International Fact-checking Network shared examples of how they’re combating misinterpretation and fake news, and how they promote International Fact-checking Day on 2 April (day after April fools, nice touch!). Hootsuite’s Content and Social Marketing Manager shared tips in building a successful community and some good examples of case studies around technical subjects, including Bill Nye’s Snapchat emoji and science campaign. Statistics Netherlands showed some great examples of working with the media to shine the spotlight on their statistics, training spokespeople and putting them out there in front of the camera, something we also do at ONS. They have a large team actively answering Twitter questions and engaging with citizens and it was insightful to see their fast-paced and proactive way of working in a social space. Overall I took a lot away from the day, and it was humbling to hear ONS referenced as a strong example of best practice in communicating statistics via social media. After speaking with communication teams who had more resource invested in social media it showed just how much we are doing and what we’re achieving with a small team of two managing the entire ONS social media estate.